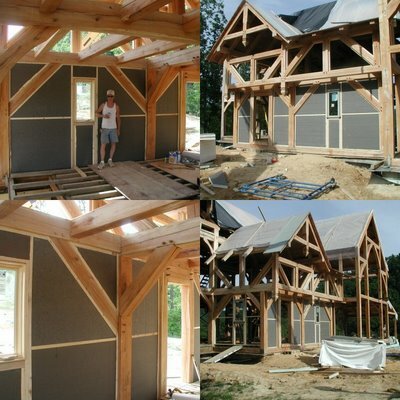 Building a timberframe home from scratch. : Non-Transparent Walls - what a concept! Apart from the inconvenience of having to walk through door frames, and look through window openings, yesterday we found "walls" to be a welcome addition to our house. Most of our house will be covered with SIPs (more on that later), but for part of our house, I decided to implement a modern-adaptation of the old style infill method used in medieval times in Germany and England. Although not as energy efficient or as maintenance free as SIPs, what I like about this method of enclosing a timberframe is that it lets you see the timbers on both the outside and inside of the house. Instead of waddle-and-daub (sticks, mud, and cow manure), we used store-bought 2x4's (ripped down to exactly 3") and 3" thick PolyIso 95 insulation made by Firestone. (For the record, I wanted to have every stick of wood in this house come from our farm, but now we're now up to 3 dozen 2x4's and 12 sheets of plywood bought from the store.) On the inside, I intend to add another 1" of insulation and 1/2" of drywall to cover the thermal breaks of the 2x3's and timber braces (so on the inside, you'll see the timber posts and beams, but not the timber braces). On the outside, I'll use some kind of cement board and stucco, leaving all of the timbers exposed out there. To combat rot and decay, I made sure to use only white oak timbers on this section of the house, since the heart-wood of white-oak has a natural resistance to rot. (Its pores are water-tight - that's why they use it for whiskey barrels.) I also built in 2 feet of roof overhang, and the 2nd floor overhangs the first floor by an additional 2 feet, so even wind-driven rain will have a hard time getting near these timbers. Finally, I used Olympic Water-Guard (a mixture of naptha, parrafin, and linseed oil) instead of straight linseed oil on these timbers. In the upper lefthand picture, that's my brother-in-law proudly posing next to his stick-framed window opening. What a fascinating blog. I'm sorry it took me so long to become aware of it. This one goes straight in the bookmark file. thank ya' mkf. I try to post something at least once a week, so please do check back! Whereabouts in KY? I'm in Portsmouth, OH and would love to see and lend a hand on this...if not already finished.